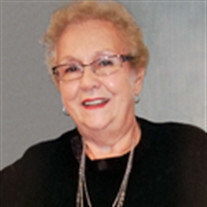 Obituary for Betty June Stromquist | Langeland Family Funeral Homes, Inc.
Died Saturday evening March 10, 2018. Betty was born December 24, 1929 in Port Huron, Michigan. She was the daughter of Harlan and Ruth (Tinsey) Dore. She had been a Kalamazoo area resident for 12 years and was employed with Baxter Healthcare Corporation for 37 years before retiring. Betty was preceded in death by her parents; her husband, Roland H. Stromquist on January 5, 2001. Betty enjoyed knitting, traveling, gardening, swimming, working word puzzles, playing the organ and working on the computer. She was a member of the Portage Senior Center where she enjoyed knitting with the Needlers group and donating knitted articles to various charity groups. She was a good listener, very understanding and encouraging. Betty also had a wonderful sense of humor and could put a positive spin on any situation. Betty and Roland traveled extensively taking the grand tour of Europe (21 countries) with other trips to Australia, New Zeeland, Fiji, Bora Bora, and Hawaii. They also traveled to Spain, Portugal, and Morocco. Their last trip together covered Ireland. The highlight of one of their excursions was a visit to all four Scandinavian countries. Roland was born in Sweden. They saw the house were Roland was born and also his childhood home. She is survived by 2 brothers, Eugene (Emily) Dore of Battle Creek, MI and Harland (Cindy) Dore of Portage, MI; and several nieces and nephews. Services will be held 11 o'clock Friday from the Langeland Family Funeral Homes, Portage Chapel, 411 E. Centre Ave. Visitation will be one hour prior to the service at the chapel. Private interment will be in Ft. Custer National Cemetery at a later date. In lieu of flowers, memorials may be directed to the Michigan Kidney Foundation, Portage Senior Center, or the American Heart Association.